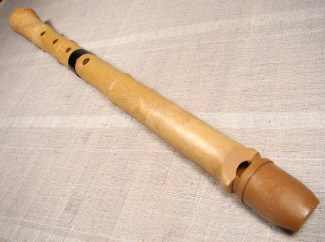 A fabulous device to assist the beginning shakuhachi player, or simply to turn your Shakuhachi Yuu into a mystical sounding Native American flute! 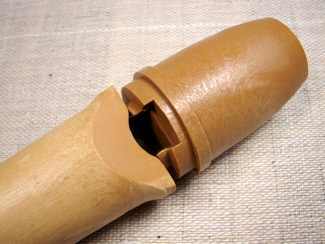 Simply insert this adaptor into the top end of the Shakuhachi Yuu, start blowing, and you get instant and effortless sound! This is an excellent tool for becoming familiar with the finger placement and basic scale on the shakuhachi, without having to focus any attention on the embouchure (mouth position). This is also a wonderful device for children who are learning to play the shakuhachi. Being able to play the shakuhachi in such a simple way will keep a child amused and interested in the instrument until they are ready to attempt the greater challenge of the embouchure. Please note: When using the Shakuhachi Yuu Adapter, it will enable you to familiarize yourself with the finger placement and the basic pentatonic scale of the shakuhachi. 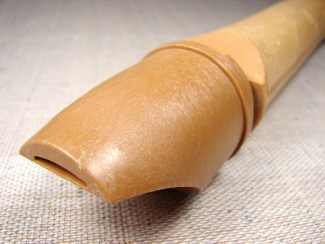 However, you will not be able to play traditional shakuhachi techniques that require dedicated practice of the fingerings and mouth position, without the use of the Yuu Adapter. Attention Native American flute players! This great little adapter will also magically transform the Shakuhachi Yuu into a mystical sounding, breathy Native American flute! The shakuhachi uses the same basic pentatonic minor scale as the Native American flute. So when the adaptor is added, you can get some of the same mystical tonal qualities as the native flute. In addition, you can use your creativity to move your fingers around quite rapidly without having to focus at all on the usual shakuhachi embouchure. With the adaptor, you can play all the way up to the “A” note on the second octave (Kan Chi), by simply blowing with more force. played in a Native American flute style! The outside diameter of the Shakuhachi Yuu Adapter, where it enters into the shakuhachi mouthpiece is 13/16″ or 21mm (and it will compress inward just a bit). The adapter joint is also covered with a piece of soft felt fabric. 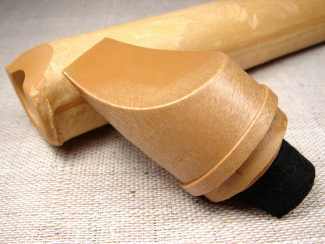 This adapter is designed specifically for the Shakuhachi Yuu. 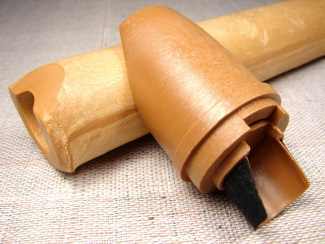 However, if you want to experiment using this adaptor with your bamboo instrument, you may do so only if the size and shape of the bore on your shakuhachi is compatible. Please use common sense! 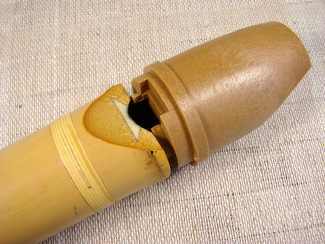 Do not try to force the adaptor into any flute where it does not fit easily and naturally, so as to not scratch or damage the bore of your flute. 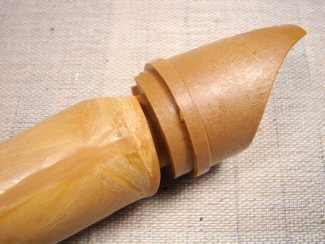 Viewing the last photo on this page, you will see the Shakuhachi Yuu Adaptor fit perfectly into a professional bamboo 1.8 shakuhachi. Please Note: No returns for the Shakuhachi Yuu Adapter will be accepted due to concerns with hygiene and respect for customers.